It's still a struggle, but I'm trying to go through pictures of Truffles and remember the happy times, not how it ended. Last year at this time she received a PetBox to review. One of the items in the box was a hanging scratcher in the shape of an owl. 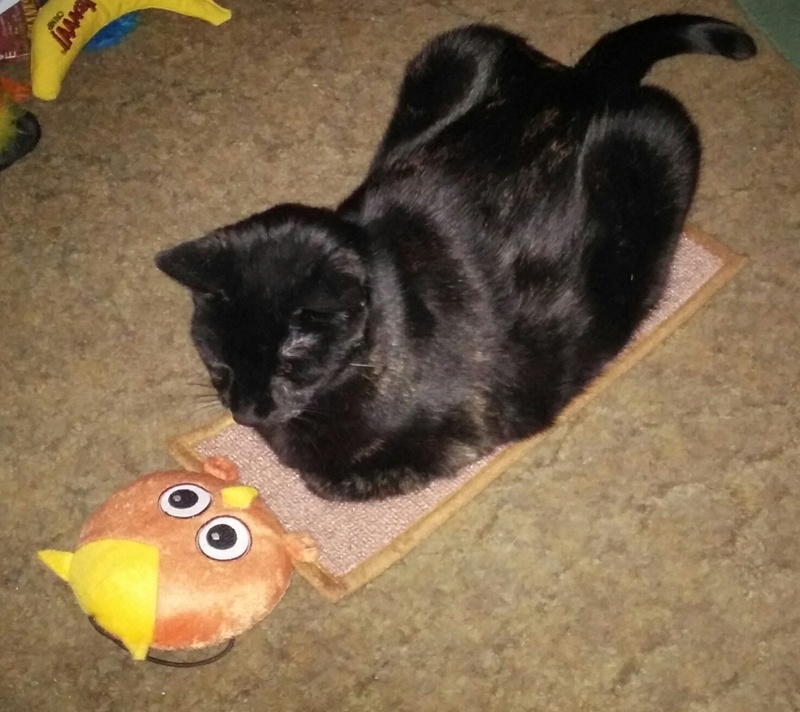 She was a horizontal scratcher so I laid it flat on the floor to see what she would do with it. She loved it, but not as a scratcher. She used it as her own personal rug space to nap on, bathe on, toss around and wrestle with. I think he might even have been her confidant who she told her secrets to. We named her new friend Chicky, and he now lives in her memory box. OMG that is SO precious. My cat Edison ran away 2.5 years ago. The bond I had with him was indescribable. I think about him everyday. I have no idea what happened to him but I'm still heartbroken. Ya use what ya get the way it werks best fer you! Truffles is so sweet with her owl. 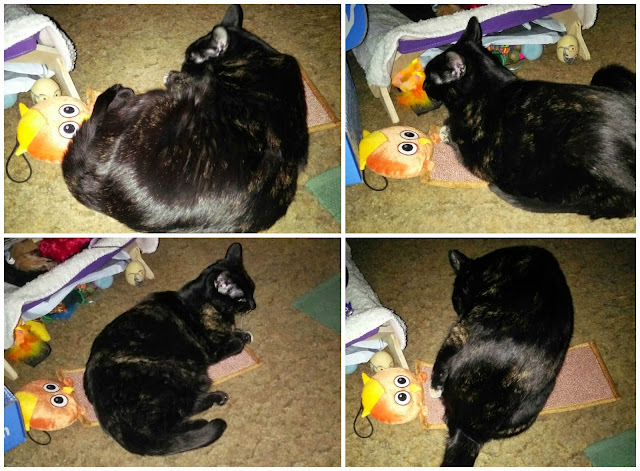 How sweet Truffles and her owl are in the pictures. These photos are so sweet. Hugs to you as you remember Truffles. Good to see you again Truffles. We had forgotten how dark you were.We think it is great that you used the owl as a bed or a toy. Very useful for everything. What a sweet memory! Memories do get easier, but it takes time to erode the sharp edges of hurt from them first. Big hugs to you. Aw, what a lovely memory. Although I know it's hard, I'm glad you're trying to remember all of those good times. That's what Truffles would want. Purrs! You must miss Truffles so very much especially when you see her playing with her owl. Thanks for sharing the memory and the wonderful photos, Melissa. These pictures are just so precious. 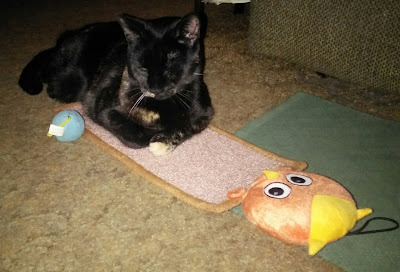 Love the one of her laying on the scratcher, almost face to face with the owl, as if it's her friend. Thank you for sharing. Very sweet flashback, Truffles was a pretty girl. That is so sweet!! I wonder where you get one of those. I LOVE owls, and Lita is a vertical scratcher (Carmine's a horizontal one). 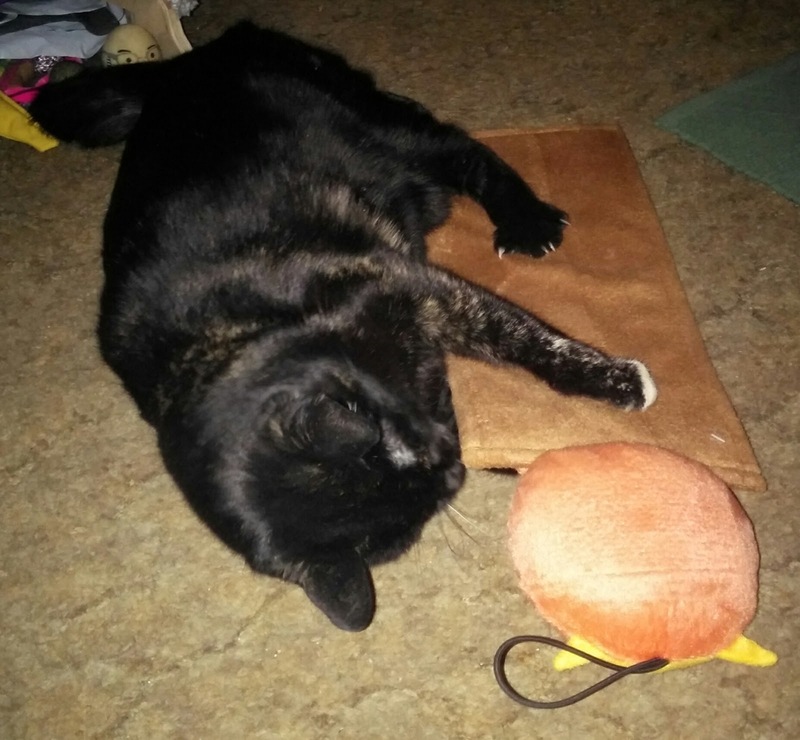 I love seeing photos of your precious Truffles, and I believe it is important to keep her close (as she always is anyway! ), but I certainly shed a few tears. Thank you for keeping Truffle's memory ever present. Those are wonderful photos thanks so much for sharing them. Thank you so much for your support of our Buddy Budd. We will love him dearly each and every hour of each and every day we have. Awww! That is a beautiful thing to remember. Truffles was a wonderful kitty. :) My Manna is also a horizontal scratcher. I understand Melissa. It's hard to remember to blot out the ending and for me at least all those photos of better days only remind me of what I longer have. Truffles really loved her Chicky. So cute!